Impulse shopping, we are all guilty as charged. The candy bars and celebrity gossip rags at the checkout counter are temptations hard to pass by. I usually control myself and resist the latest news about Britney Asparagus Spears. The chocolate bars are a little more difficult to pass by. Our local Mega-Food-Barn had a stack of "Grill On The Go's" stacked right next to the wall of chocolate treats. It is not fair to dangle the carrot in front of the Mad Meat Genius. I was driven/lead to part with my 6 dollars for you dear readers. This purchase is in the name of barbeque research. Grill on the Go is packed in a neat and tidy food decorated box.The food that is pictured happens to be all vegetables. Where is the beef? There are three grills included in each box. That actually sounds like a good deal. Less than two dollars for a portable disposable source of charcoal heat. The box claims one hour of cooking time. They also say it is easy to use and will be ready to cook in just five minutes. There are a couple of other instruction, like do not pick up grill when lit and do not use indoors. That sounds like sound advise to me. More packaging was removed to reveal a grill that had some lighter fluid drenched diaper on top of the coals.A match was lit and instantaneous human combustion occurred. Well actually it was just the grill. The box claimed 5 minutes until ready to use. I waited 10 minutes to be sure all the lighter fluid was burned off. Grill on the Go actually performed very well. 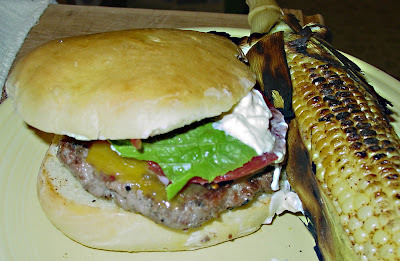 We cooked some corn first and then followed with some burgers. The heat was hot and consistent. A wok lid was used to melt some cheese on our burgers. We had plenty of fuel left over after our meal were done. Grill On the Go is an inexpensive, portable and disposable charcoal source. This would work great at a tailgate. I am even thinking of bringing it to work and cooking some burgers in the parking lot. That might not go over to well with the Salt Mine managers. I was not to keen on the lighter fluid soaked diaper. We did not taste any chemical flavor with these charcoal. If you happen to see a box at your local store, Go-for-it. The Mad Meat Genius gives Grill on The Go a thumbs up. Happy BBQ! Dr. Biggles made me do it! I notice you put yours on a metal surface - would it ignite a picnic table or the melt the tailgate of a car? I'm glad you are undertaking this serious and important research for the benefit of mankind. Zoomie it has two metal wire legs to raise it from a surface. They were kind of flismy and I did not use them. So, yes you could use it on your picnic table. I wouldn't.